Also known as Kroaz Du, the Black Cross was used as the banner of the independent Duchy of Brittany in the late Middle Ages. This flag is often used as an alternative flag to represent Brittany in cutural celebrations. Likely to date back to the 13th century, the flag of the independent Duchy of Brittany is the oldest Breton flag. It was widely used as the banner of Breton soldiers and as the flag of Breton ships during the 15th century. The Black Cross started to fall into disuse after the union of Brittany with France in 1532 and the French Revolution of 1789, until it was eventually replaced by the modern Breton flag in the 20th century. 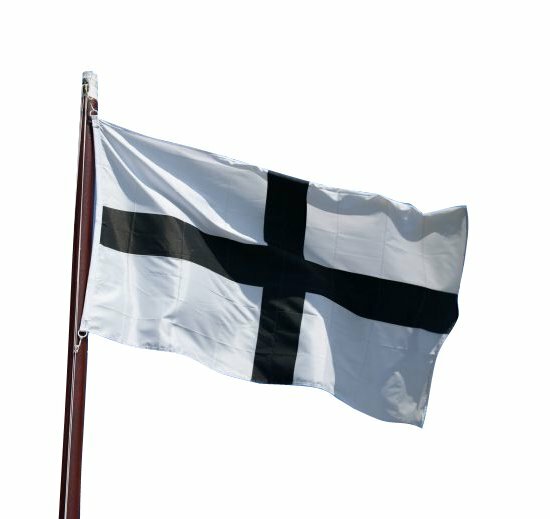 + Flag of the Duchy of Brittany, Kroaz Du (Black Cross), size: 150x90 cm (3'x5').